So far my feelings about Michelle Moran’s novels have been very mixed. Cleopatra’s Daughter was interesting, but felt too light and insubstantial, The Second Empress was much better, but I had one or two problems again with Rebel Queen. I had hoped Mata Hari (also published as Mata Hari’s Last Dance) would be another good one, but unfortunately it turned out to be my least favourite of the four that I’ve read. Before I read this book, all I knew about Mata Hari was that she was an exotic dancer who was accused of spying during the First World War. I felt sure that she must have been a fascinating woman and I was looking forward to learning more about her. And I did learn a lot from this novel. Mata Hari narrates her story (fictional, but based on fact) in her own words and tells us all about her dancing career, her experiences of life in European cities such as Paris and Berlin, and her many romantic relationships, including several with military personnel which led to her being accused of passing secrets to Germany. However, I wanted to get to know the woman behind the newspaper headlines and the seductive costumes – Margaretha Zelle, or M’greet as she is called in the novel – and although she does confide in us now and then about her childhood in the Netherlands (she did not come from an Indian background, as she tried to claim), her time in Java during her unhappy marriage to Rudolf MacLeod and her heartbreak at the loss of her children, I never felt very close to Mata Hari and didn’t gain a very good understanding of the person she really was. The one aspect of Mata Hari’s life that Moran does successfully capture is her loneliness; I didn’t like her and had very little sympathy for her as she seemed so immature and selfish, but I could see that she was not a happy person and that her character had been shaped by her earlier experiences. The descriptions of Mata Hari’s various dances are also well done, particularly one that she performs with a live snake while dressed as Cleopatra. The novel is strangely lacking in period detail, though, and apart from the obvious references to the war and to other famous people of the time – her rival dancer, Isadora Duncan, for example – I didn’t feel that there was much sense of time or place at all. The book is also disappointingly short, with under 300 pages in the edition I read. If you just want a basic overview of Mata Hari’s life and career, it’s perfectly adequate, but for something deeper you will need to look elsewhere. The section of the novel covering her spying activities is very brief and feels almost like an afterthought, which is a shame as this is the part of the story which should have been the most interesting. Even on finishing the book, I’m not completely clear on what we are supposed to assume; was Mata Hari really a spy or was she just someone who had made some poor decisions and been carried along by events outside her control? To be honest, long before we reached this point I had lost interest anyway and had already decided that I would need to look for another book on Mata Hari one day. Has anyone read The Spy by Paulo Coelho? Six in Six – the 2017 edition! It could have been a great book but it was too short and light and didn’t go into any depth at all. I will keep looking too! I’m sorry you didn’t like this one that much, but from what you said, Michelle Moran painted a very flat portrait of Mata Hari. Unfortunately, I haven’t read anything about her, so I can’t point you in a better direction. 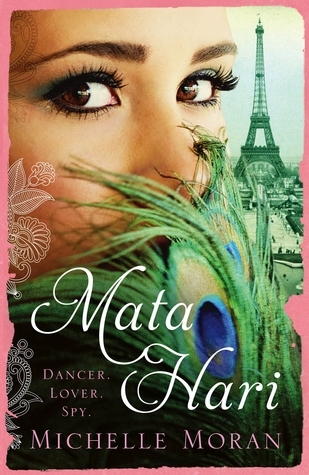 I think Mata Hari is a great subject for a novel, so it’s disappointing that Moran didn’t bring her to life very well. I do want to read more about her as she had such an interesting life. So, it didn’t sound like you really loved any of them? I liked The Second Empress but the others have been disappointing. I probably won’t read any more of her books. It sounded like you were about there. Aw what a shame! I think a deeper look into Mata Hari could have been great! My gust instinct has always been she was someone in the wrong place, making the wrong decisions! I’ll have to keep searching for a better book about Mata Hari. This one was disappointing but at least it left me wanting to know more about her. I too thought Cleopatra’s Daughter was very light and boy! Did I have issues with Rebel Queen! I however did feel her Madame Tussaud was a relatively mature work, but I see with both Rebel Queen and your review of Mata Hari, her writing is becoming assembly line products! I wonder if her most recent books have been rushed out too quickly – this one was only published a year after Rebel Queen, which could explain why it is so short. Maybe I should have read Madame Tussaud instead! Well thank you for steering me away from Michelle Moran. I had a feeling she would be not up to my standards. I have not read anything about Mata Hari. The Spy has very mixed reviews on Goodreads. It is even shorter: 208 pp! No, I don’t think she would be your kind of author! The Spy doesn’t sound great either, but could be worth trying. I’ve just found another possibility – Signed, Mata Hari by Yannick Murphy. It was well written and brought the period to life but I don’t think it got to the heart of this extraordinary woman. I was thinking about reading Michelle Moran’s book but now think I will give it a miss. The non-fiction work Femme Fatale: Love, Lies and the Unknown Life of Mata Hari by Pat Shipman is now on my TBR list, it also has some good reviews. I’ll probably try The Spy at some point, so I’m pleased you thought it was well written, but sorry to hear it doesn’t get to the heart of Mata Hari’s character either. I’ll think about adding the non-fiction book you mention to my TBR too. Mata Hari sounds like such a fascinating woman – I would like to read more about her, so I’ll keep looking out for a better book. I’ve read your review of Girl in Disguise and it does sound good!